“Precipitous,” photo by Stanna Frampton. The starting point of the project and centerpiece of the exhibition is “Implications,” a collection of 30 accordion books that expand into an image of glaciers in Iceland – where Pietrantoni spent a year as a Fulbright scholar. Pietrantoni credits this experience for her transition from an amateur photographer into a more conceptual, critical thinker of the medium. “I was confronted with this gorgeous, sublime beauty as I was taking photographs across the island,” she says. “And I thought, it’s so beautiful – but now what? What do I do with these photographs? 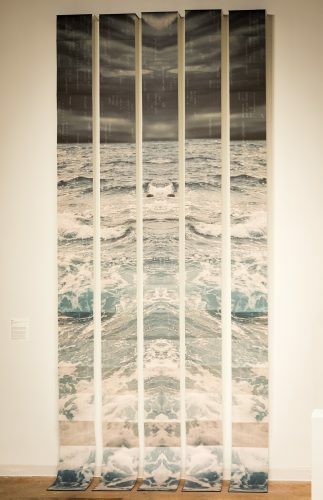 How do I speak in a more pointed way of how we make images of these ecologically fragile places?” Years later, the idea culminated with “Implications,” which also is layered with text from the climate change report and Wootten’s excised poetry. Pietrantoni, an associate professor of printmaking and book arts at Whitman College in Walla Walla, Washington, views the book as an encyclopedia, a container of knowledge and preservation of memory. Within the context of this project, the book acts a documentation and collection of landscapes that are constantly changing in response to human actions. 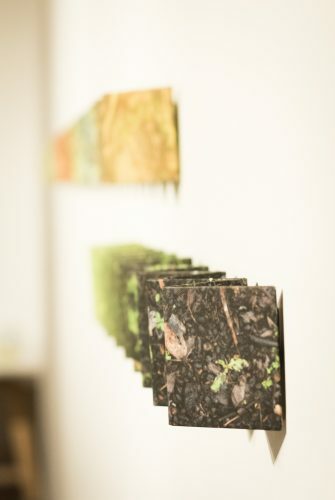 The book, as well as her work as a whole, then becomes a metaphor for our relationship with nature and how we interpret information in a digital age. Pietrantoni’s images are majestic yet haunting in their overwhelming and altered presence. For “Rainbow” and “Forced Green,” however, the final pieces created for the project, Pietrantoni transitions from grandiose views to macro visions of the earth beneath our feet. These photographs were taken of the ground just outside her studio at Whitman and digitally stitched together into a panoramic image. The material for these pieces is also a break from her other work; while they maintain the creases and bends of her accordion books, they are made from steel for the artist’s aesthetic interest in hardened folds and crisper edges. The transition to a sturdier archival material also strengthens Pietrantoni’s view of the book as an object of preservation. The steel, however, is wrapped in Japanese paper that contains the printed image with subtle transcriptions, referring back to and blending with the aesthetic of the exhibition. Detail from “Rainbow” and “Forced Green,” photo by Stanna Frampton. 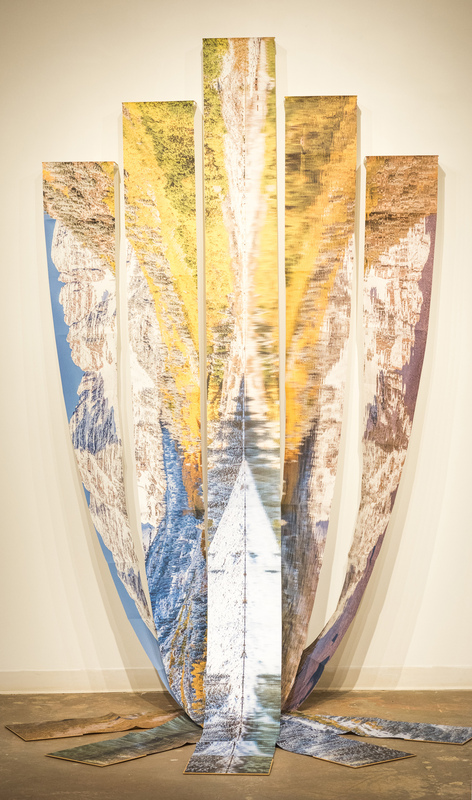 Wootten, who is Pietrantoni’s husband and also a professor at Whitman College, is a critical connection between Pietrantoni’s images and the overarching concept of the installation. The title of the exhibition, Alas, Alack, is a phrase taken from one of Wootten’s poems. His opening line on Pietrantoni’s “Precipitous,” “… this is a record of loss and abundance…” frames the exhibition as one of sadness for the fragile state of our natural world, yet reminds us that all is not yet lost. The beauty documented in Pietrantoni’s photographs, from up-close views of dirt and grass to wondrous vistas, reminds us not to overlook or forsake the landscape that surrounds us, and to fight for its lasting abundance. Nicole Pietrantoni: Alas, Alack, Main Gallery at The Kimball Art Center, Park City, through April 15. Kelly Carper is an Ogden-based arts writer with a background in Santa Fe’s commercial gallery world in sales, marketing and management. Her current freelance work extends from arts journalism to gallery marketing and can be found at kellycarper.com.